If you take the road from Bad Sobernheim to Gemünden, you cut straight across the Soonwald foothills before reaching the Zollstock heights and as you approach the hamlet of Daubach the forest opens up and your view falls on the main Soonwald range in the distance. On the highest point a television tower has been placed. This point, which is also the highest point of the entire Soonwald range, is called Ellerspring. In order to visit this place you have to drive past Daubach, Winterburg, Winterbach and Kreershäuschen to the "Rennweg" which has car parking for hikers. Rennweg (the name can probably be deduced from "Rhine Route") is one of the most ancient long-distance roads of prehistoric times. It runs along the Hunsrück Heights and today is a part of the European long-distance hiking trail No. 3, which leads from the Atlantic to the Black Sea. Entenpfuhl is the name of the surrounding forest district which encompasses almost boundless and wholly untouched emerging forests where the legendary Hunter of Kurpfalz once roamed. One mountain hike that is very much worth doing leads up from Rennweg to Ellersping and from there on to upper Gräfenbach Valley, where there is a nature reserve "Glashütter Meadow" with species-rich grasses: a mixture of yellow oat, mat-grass, and forest bulrushes. From Gräfenbach Valley the pathway leads to Simmernkopf (653 m), which has a gorgeous view over the Hunsrück heights to Kirchberg, the Nunkirche Church and the Hunsrück Cathedral in Ravengiersburg. From Simmernkopf the path leads on to "Kohlweg" trail along the mountain ridge that runs parallel to Rennweg. After about an hour, above the forester's house on Ellerspring mountain, you reach a narrow road, which you cross in order to finally reach the Wildburg heights (Wildburghöhe). 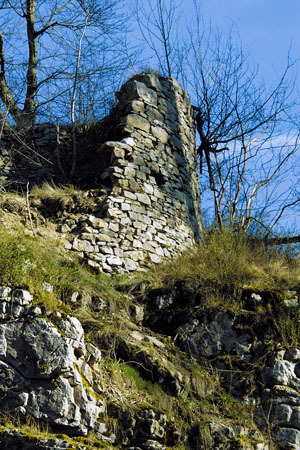 Here, on the quartzite cliffs, stand the ruins of the keep of Wildburg Fortress, which was first documented in 1253. Now in a state of dilapidation, the structure once had a base of about 140 m by 100 m. It was protected to the south by a moat and to the north by a circular trench surrounding the rampart. The mighty southern wall system was possibly of Celtic origins; it is easy to imagine that a place of refuge for the Celtic Treverians once stood here. In the Middle Ages the royal woodlands were governed from Wildburg and the roads from the Nahe River through central Hunsrück to the Mosel River were protected by it. The few remains of walls that still stand together with the rugged rocks in this isolated place abruptly cast a spell over the visitor. Here, on a warm summer's evening, it can leave a lasting impression when you watch the last rays of the sinking sun light the sky off in the west, while in the valley below twilight has already set in. Especially impressive is the contrast of a visit in winter when snow lies on the ground and the castle on the ridge of Soon Forest, defenceless against the cold winds, gives you something of an idea of the solitude and pitiless cold which the people of the Middle Ages suffered. The return journey leads across a boulder field, down past the forester of Wildburg's lodge and from there, on to Lamet creek. This creek flows in a depression between the two Soonwald main ridges through boggy meadows and moors, which is a conservation area. Then the path leads a bit uphill again to Rennweg. Finally, after 6 hours, you will reach your starting point after a wonderful day and a glorious hike.